Glenshiel Highland Pony Trekking Centre is a small family run business that offers pony trekking and trail riding in the Highlands of Scotland. We also offer a range of bed and breakfast and self catering accommodation ideally located at Shiel Bridge on the A87 road to the Isle of Skye, close to Eilean Donan Castle at Dornie and at the foot of the spectacular Five Sisters of Kintail mountains. Pony trekking is available from May to September each year. 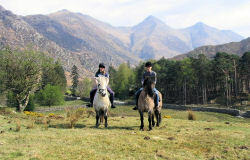 All of our Highland pony treks are customised according to your group's requirements and horse riding experience. Pony treks are done in groups of a maximum of six riders, providing you with a highly personalised service. We offer a selection of pony treks ranging from a days pony trek into the hills to an hours ride along the shore of Loch Duich, all in stunning, dramatic settings in the Scottish Highlands. 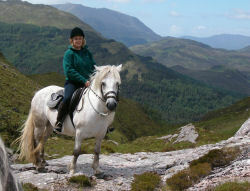 Enjoy amazing scenery and wildlife riding our fun, safe Highland Ponies across Loch Duich, through Ratagan Forest, or trek into the mountains of Glenshiel, including the Five Sisters of Kintail. Prices for pony treks are £30 per person per hour with group discount available. Lessons, suitable for all the family (children aged 6 and up), are £30 for 45 minutes. We are fully approved, licensed, and insured, and members of The Pony Club. Highland ponies are a unique pony bred to live and work in the rugged Highland landscape. The Campbell family have been breeding ponies in Glenshiel for over 100 years and some of our ponies are direct descendants. 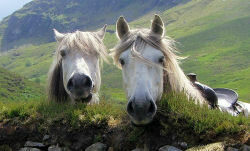 The Highland pony is well known for their kind nature and ability to take their riders across some very rough terrain. 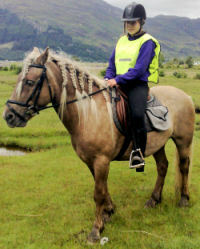 They are ideal for pony trekking in the Highlands and kind to the environment too. We have bed and breakfast accommodation nearby with two double and two twin rooms, and two extra beds available for children. All rooms have a television, there is a breakfast room, and washing and drying facilities are available. Our rooms offer fantastic value from £30 per person, with breakfast also available. Bunkhouse accommodation with satellite TV from £20 - 25 per person per night, depending upon season. Price includes bed linen. Glenshiel is located on Loch Duich just off the A87 60 miles north of Fort William and 70 miles west of the Highland capital of Inverness. Address Shiel House, Glenshiel. IV40 8HW - see where we are on the map. Our ponies are also offered for sale. They are all young stock and sometimes ridden ponies are available - please contact us for details. All content on this page is copyright of Glenshiel Highland Pony Trekking Centre may not be copied or reproduced without the explicit written permission.